One look, and you’ll see the sleek silhouette. A bit closer, and you’ll notice the eye-catching details that make this shoe so special, like the textured leather accents and chic embossed button. Plus, it’s built with a deep toe box for the comfort you need every day of the week. Excelente, nurse mate always excellent! This style the best so far and never a problem with this company. Thanks again! This shoe has a fairly high heel and because of that, ran too short for me. Doesn't come longer than size 11. I also would prefer a rubber sole instead of a plasticized sole. The sole is cushioned though and comfortable to walk on. I like the style of this shoe. Button detail is stylish. Theyre not too high and so far, so good. Im going through the break in period, but I foresee a comfortable, stylish fit after my footsies get used to them. I do have some foot issues but so far Ive not have to use any orthotics to accommodate the fit. Im able to wear as is. Satisfied with my purchase. Good fit. Soft foot cushion inside the shoe. Very comfortable. Love this shoe's style and comfort! The little button and weave detail make this shoe stylist, while the cushioned toe box and pillow top cushioning make it comfortable. Sadly, I had to return these because I have balance problems that do not allow me to wear heeled shoes. They were speedy upon arrival and they were on an incredible sale. Would recommend them to anyone. 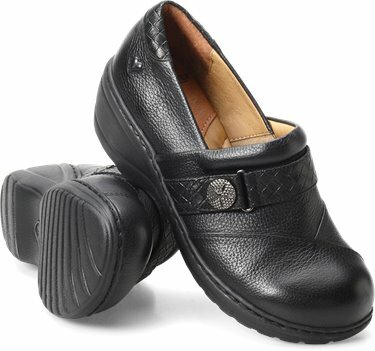 These black shoes are amazing in that they are not only cute with the button detail, but they are extremely comfortable with their deep toe bed and pillow top insole. I absolutely loved this shoe, but was unable to walk in them due to the 1.5 inch heel. I am a woman of size which makes my balance a little bit off so these were just not the shoe for me. I am also very impressed with Shoeline's fast and speedy service. I did not have to wait long to try on my purchase unlike their competitors that made me wait weeks! !